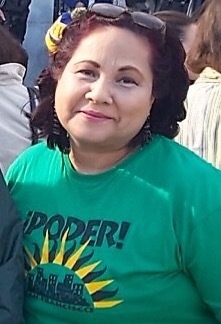 PODER | Meet our Promotora, Maria Elena Ramos! After the outcome of the 2016 November Election, our immigrant communities must remain calm, informed, and prepared more than ever. In the coming year, it will be important to share any new information that can support our communities as well as refresh ourselves of existing laws already in place to help. One in particular is the Language Access Ordinance (LAO) which ensures that all city departments in San Francisco provide services in the three certified languages: Spanish, Chinese, and Tagalog. 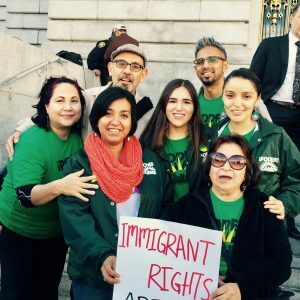 Our Promotora, Maria Elena Ramos, has done an amazing job outreaching to our immigrant communities in the Mission and Excelsior District around the LAO. She first became involved with PODER 7 years ago shortly after moving to the U.S. and settling in the Excelsior District. Maria Elena describes herself as “una mujer luchadora y vengo de El Salvador” and she proves this through her activism and strong will to help her community. Working with our Promotora has given us the opportunity to expand our community education efforts and speak with over 500 people in 2016. We will continue our community engagement work so that our immigrant and monolingual communities stay prepared and informed. With our promotora we will continue to share information on linguistic rights in San Francisco so we can all access the services we need, in a language we understand. Come by our office to find out about workshops near you lead by our warrior promotora, Maria Elena Ramos !